How to increase ADSL line speed on a typical Telkom's 4meg line from 2211 down stream to 3899. Most routers will keep dropping line speed to get as close to 6db noise margin as possible. You can't change this. 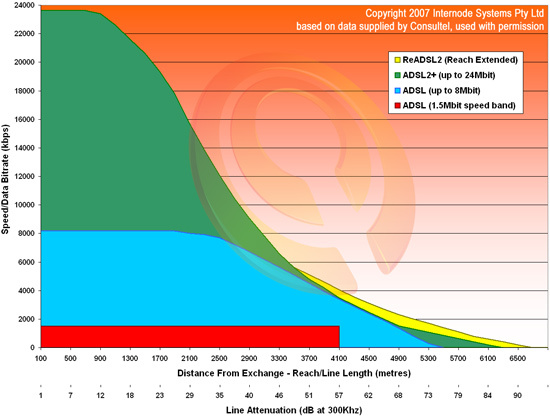 Routers aim for a target noise margin of 6db (for our adsl, 12db for adsl2+) and alter the connection accordingly to reach this target via the SNR's. The attenuation is perfectly fine for a 4mb connection, just not capable of more. Using our copper wires, you take your attenuation, and divide it by 13.81 (because standard gauge copper (0.4mm) has a loss of approximately 13.81db/km).